Writing your family history down is an important tool for you and your health. It’s also helpful to your children and their children, further down the road of life. The free Family History Records is a template that helps you organize the important information about your family’s health history. You can store this data for future generations to use. The free document is a simple Excel sheet that has all the items listed for you. You just need to fill them in with your own medical information. To learn how to download and use the free template today, just follow the instructions given below. 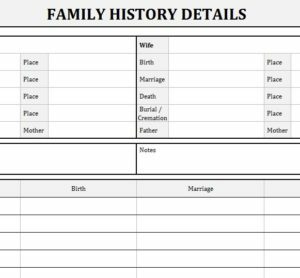 To download your free copy of the Family History Records template, just follow the link we have conveniently provided below. Take a look at the structure of this document. You have a space for the medical history of both a mother and a father. You can work your way down the family tree from there. The idea is to provide an accurate medical history for your children. Take the time to fill in the information for your own parents, as best you can. The next step is to scroll down to the “Children” section below. Here, you will enter the birth, marriage, and death information for the next generation. For example, if you started with your grandparent’s history, the child information would be entered for your parents. When you want to continue to the next generation, you can copy the page and repeat the same process for the next generation in your family. You can make sure your family has the health history they need by filling out this template today!